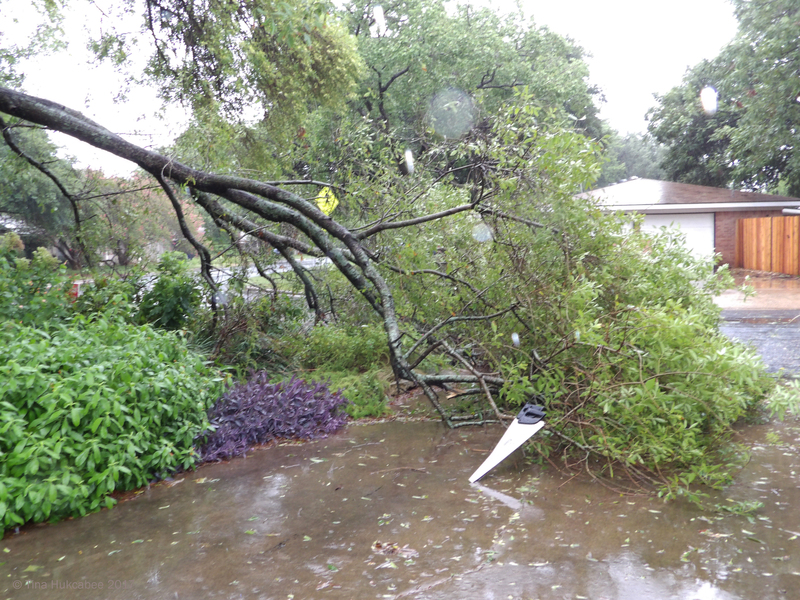 The damage my garden received from the rains generated by Hurricane Harvey was nothing–really nothing–compared to the destruction wrought throughout southeast Texas and into Louisiana. What Rockport, Port Aransas, Houston, Beaumont and other areas endured was catastrophic. While harm inflicted to my garden was annoying, it will allow for a transformation of an heretofore shady situation to one where sun lovers will flourish. Yeah, that’s a problem. 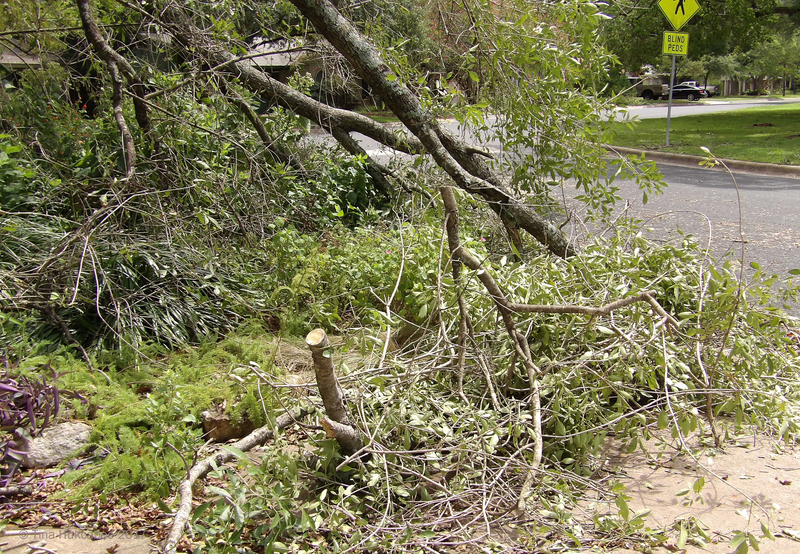 This mangled mess was caused by the 10-plus inches received that weekend and occurred in the form of a half-downed tree. 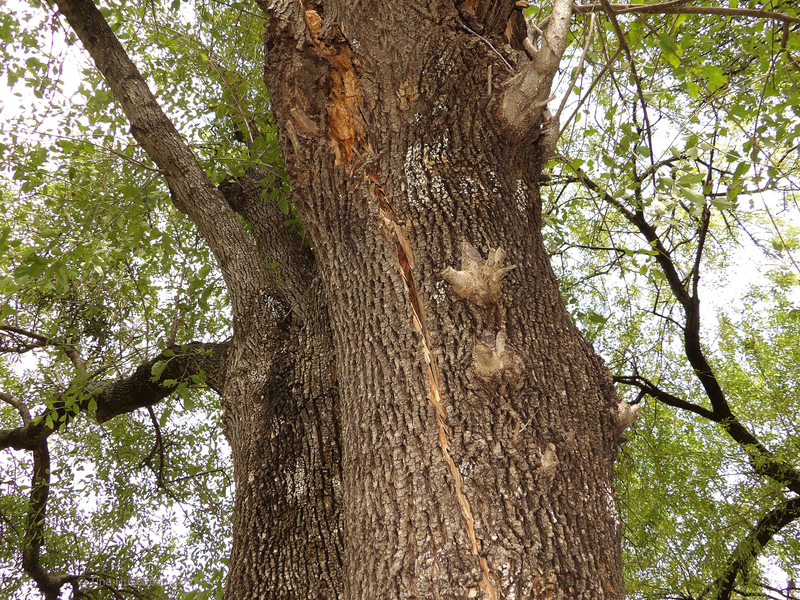 This mature Arizona Ash split at one of its two main trunks, not at the crotch (which might be expected), instead, a bit higher up. Splayed foliaged and branches decorated the front garden, street, and driveway. I called my arborist that morning, but he wasn’t able to take this job. 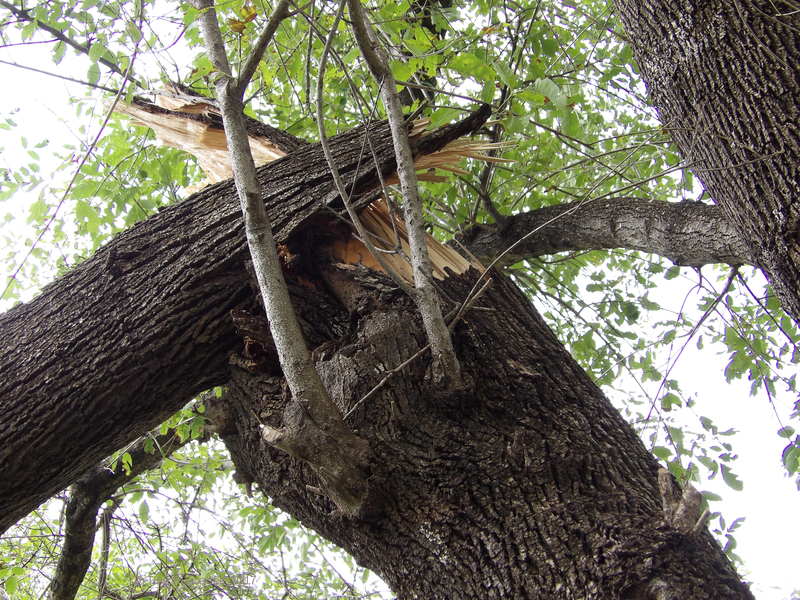 I made several other calls, securing a promise from a neighbor’s arborist–I was 7th on his list. 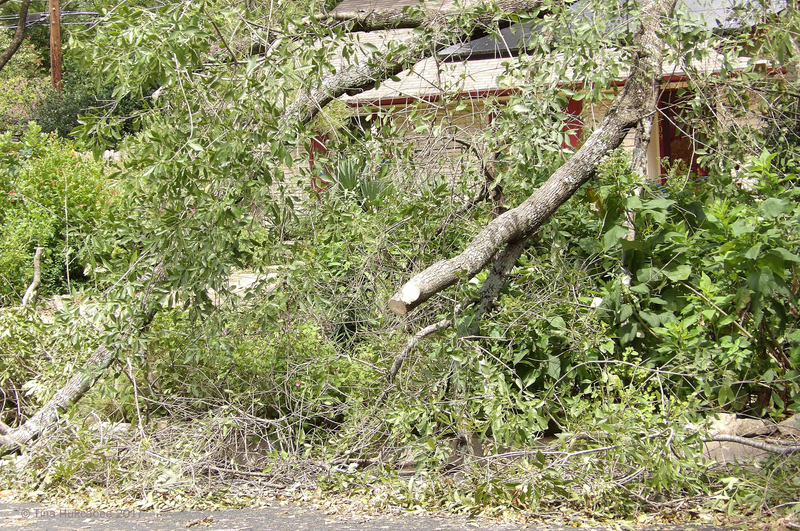 Because it was unclear how long it would be before the arborist could work some pruning magic on the tree (it ended up being 10 days), we gathered various saws and pruning utensils and got to work on the smaller branches in the street and along the driveway to tidy the tangle of tree. 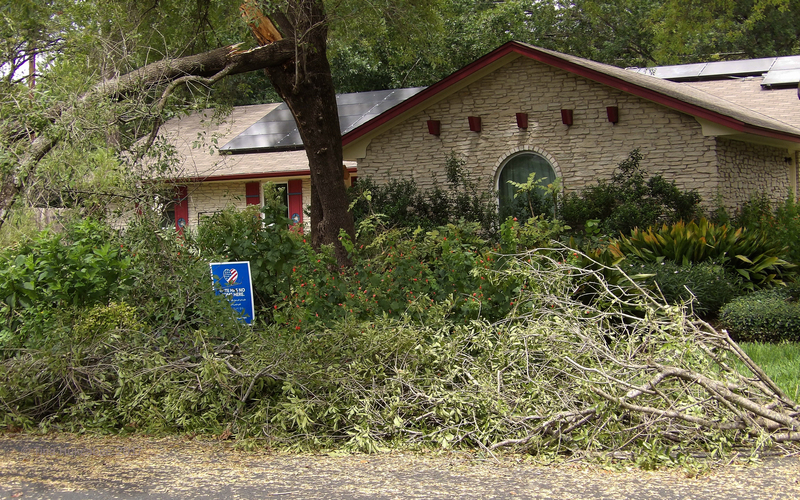 A week after we pruned, some lovely guys from the city of Austin’s waste crew came by and removed most of the tree detritus. 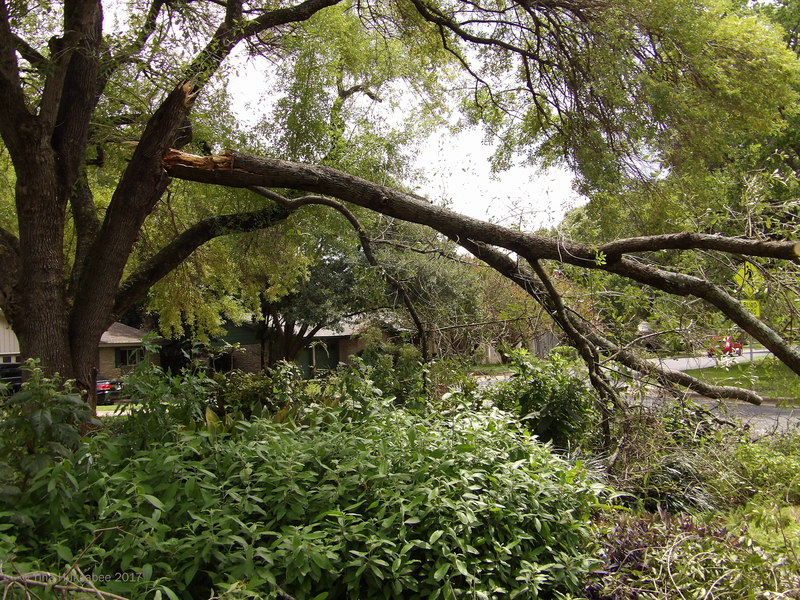 Eventually, the arborist crew arrived, took out the rest of the large branches, and all was cleaned up. The garden was ready for an assessment and possible re-do. 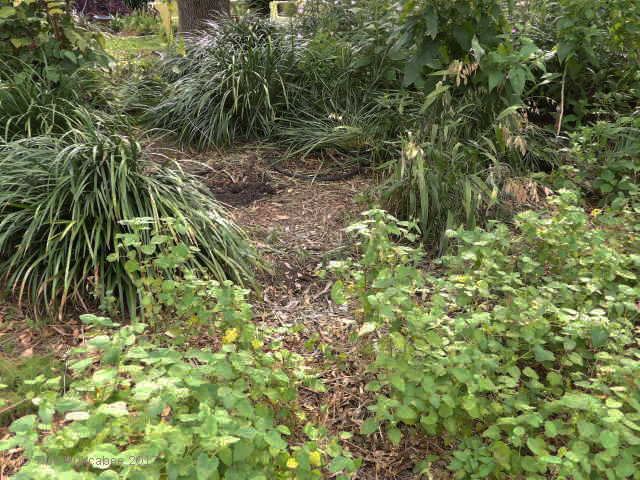 The fallen branch injured the Giant liriope and Inland sea oats that dominated the center part of this formerly shady garden. With less overhead foliage, allowing for dappled morning and early afternoon light, and a now-clear western exposure, which means that the bright Texas sun will blast on the front of this garden, a reconsideration of plants is definitely in order. 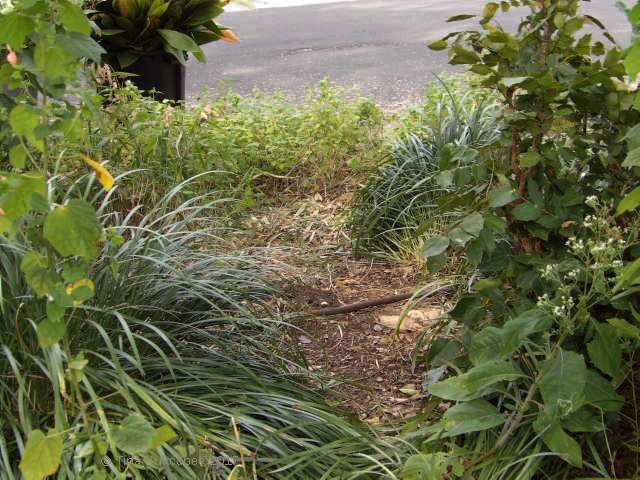 In this shot, some liriope has been removed, leaving a space for…? Prior to the tree-fall, only the outer edge of this garden (at the street) received direct sun; after the tree-fall, all of this is in full sun. 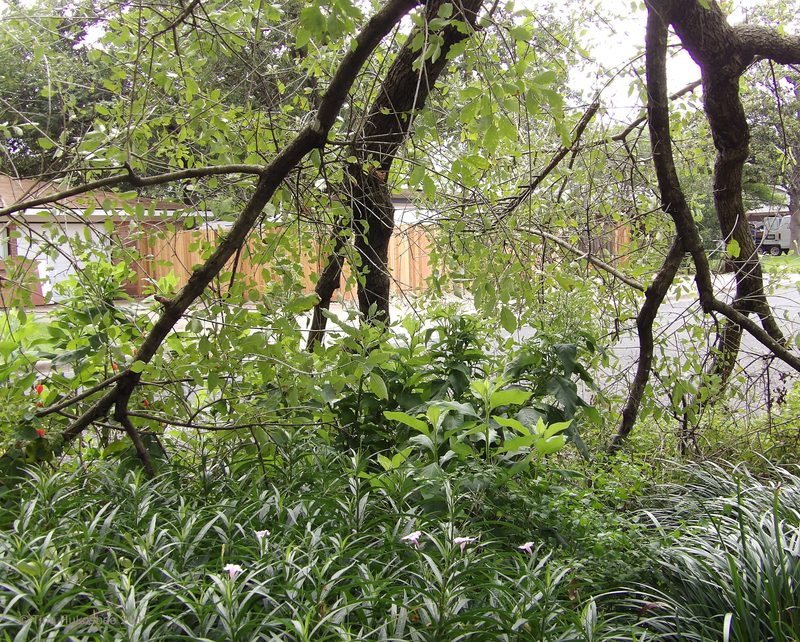 This shot is taken from the street, looking toward the center part of the garden. The plants at the front of this photo are Rock rose (Pavonia lasiopetala) and thrive in full sun. 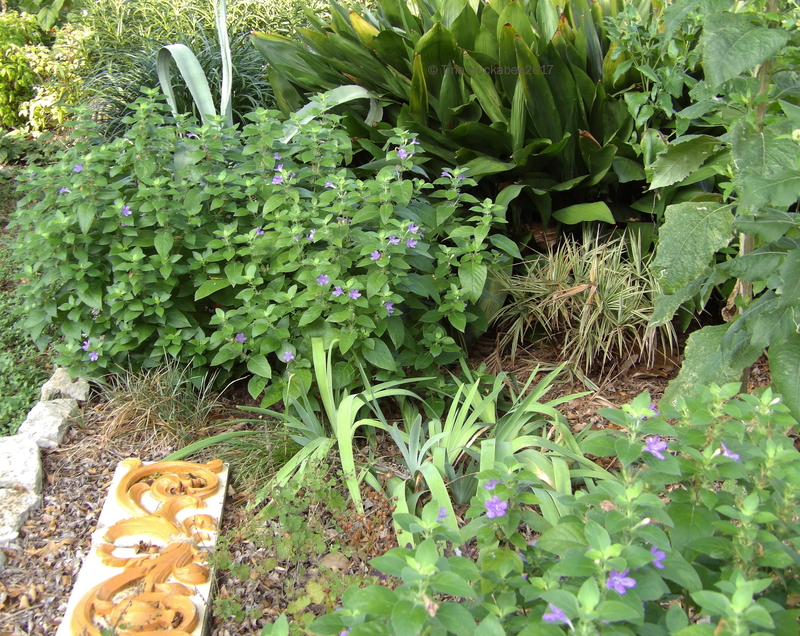 The grassy Giant liriope can handle sun, but I’ve pulled them in favor of other perennials. 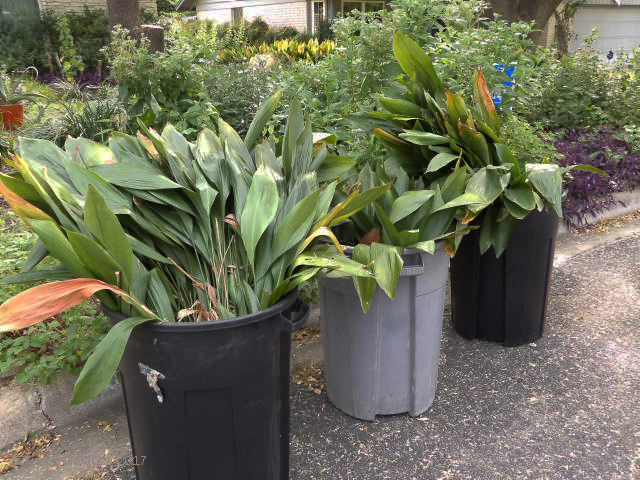 The dry-shade loving Cast iron plants, Aspidistra elatior, must go–they will fry in the sun’s rays. The deep green Cast iron is at the top of the shot, to the right of the silvery agave. I’ve enjoyed the Cast iron plants in the front garden–there were three groups, only one remains for now. They’ve provided evergreen structure in winter and a lushness that soothes in our hot summers. But go these must and in fact, I’d already planned to remove one large section (opposite from this photo) this autumn because it’s receiving more sun, due to a neighbor’s declining trees. I’ve removed the Liriope, Cast iron plants, and the Inland sea oats, finding homes for some, transplanting some, and ditching the rest. Three of many bins of plants from this project. The plants won’t go to the landfill, but will end up as part of a sewage-sludge product called “DilloDirt,” an excellent garden amendment. I’m in the process of transplanting some sun-starved shrubs and perennials from my increasingly shady back garden, looking forward to their thriving in a new, sun-doused home. 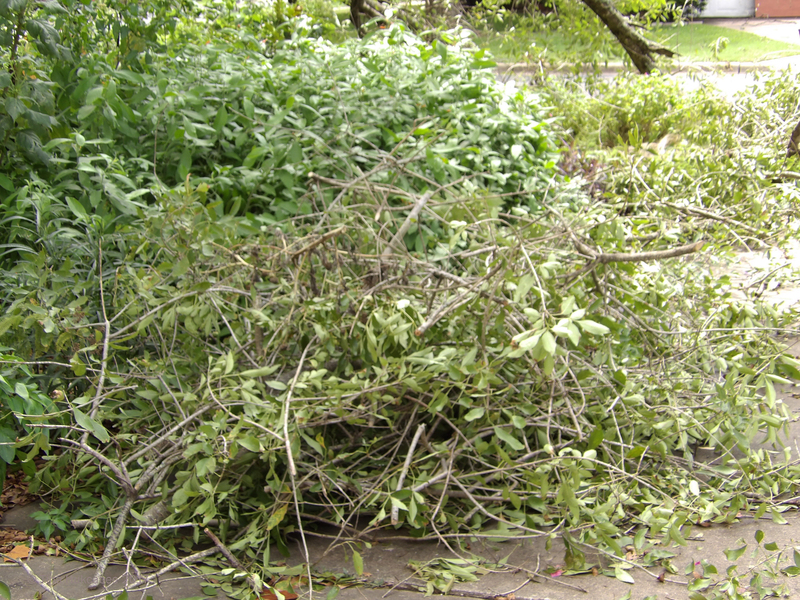 The fallen tree was a win-win for both gardens and for friends who were wanting shady plants for their gardens. Blooming along with some happy Drummond’s ruellia (Ruellia drummondiana). 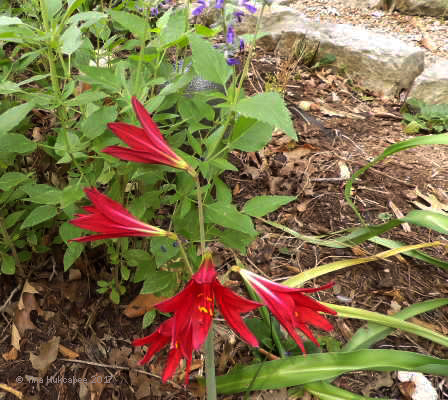 …and a clump or two of Oxblood lilies, Rhodophiala bifida. That said, neither of these beauties showed off much in my garden this past month. 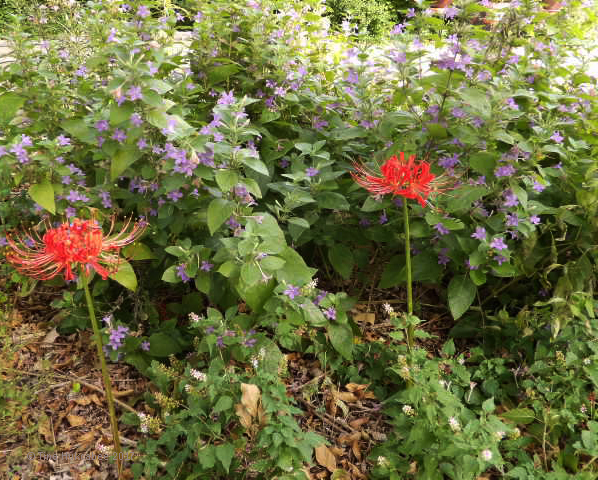 Typically during September, there are several clumps of each that pop up and POP in the garden, responding to early fall rains. This year though, they’re sulking and hiding for some reason. Perhaps 10 inches over one weekend was too much rain? You really had more damage than I did. I just had a few plants that didn’t enjoy sitting in water, they were leftovers from the drought years. I’m glad you can make over some beds. I had that opportunity when we had a freeze last winter. 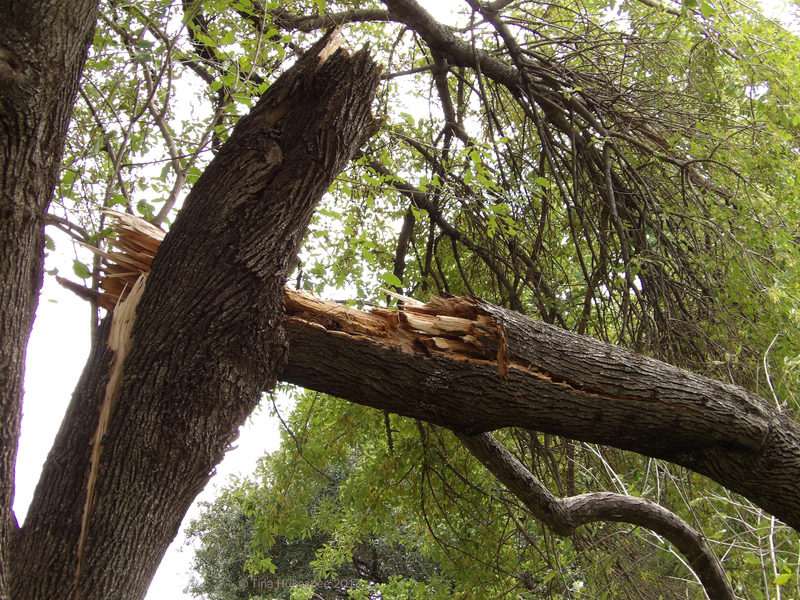 Yeah, I was surprised that my tree split as the two neighbors on either side of me have older, bigger Arizona Ash trees and there was little damage to theirs. These trees are crap trees, so I’m never surprised when there’s a problem. I’m in the process deciding about a new tree to plant as a someday replacement. I probably won’t be around to enjoy it, but someone would be. 🙂 I’ll stick to a native–it’ll be tougher. It’s fine to re-do a bed and it was way overdue! Wow, so sorry this happened to you. At least there are some positives. 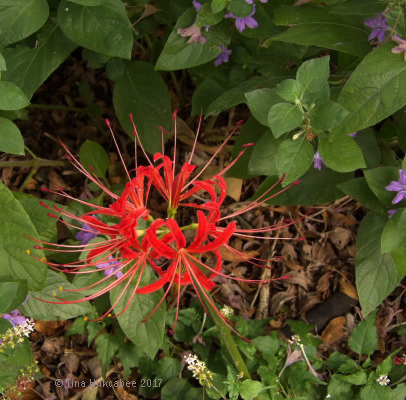 I love those red spider lilies. I used to have some blooming in my yard, but didn’t know what they were called because my mom gave them to me. She had brought them to me from El Paso, TX where my aunt had them in her yard. My mom dug them up and brought them to me when she moved to the Dallas, TX area. My aunt had passed and my mom didn’t know what they were called. Mine aren’t blooming any longer. Now I know what to go buy to replace them. Thanks, have a great day! Oh yes, this was really a minor glitch. I’ve done most of the tranplantation, though there’s a bit left. I sprinkled some native wildflower seeds yesterday before the rain started and hope they fill in. Tina, I’m sorry for all the damage you’ve done. But a new era begins. The poor tree has been battered but has let the light through the garden. New plants (despite having to be removed from some) beautiful people will populate your garden and some that were already better and grow and bloom more. I know it’s a too dreamy look at the real situation Tina but as a Spanish saying goes “Bad weather good face”. It has all my support. I hope all problems are resolved as soon as possible. Have a very good week. Greetings from Margarita. I like that: “Bad weather good face”–it covers everything. I’m enjoying the project and hope that the garden re-do is a success. You have a good week too, Margarita. Gosh, those of you affected by hurricanes have really been through an ordeal! Even if you didn’t face the worst of it, it’s still a shock and an adjustment. I’d say you’re taking it all very well. As you say, lemonade from lemons. 🙂 Our neighbors lost a huge old Oak earlier in the summer from straight-line winds during a bad storm. It really opened up the canopy in the back. I’m hoping for more ephemeral wildflowers next spring. I can’t wait to see the results of your plans! Well done for viewing the damage as a positive for planting change. I’m glad you didn’t suffer more than a damaged tree. I’m very fortunate and try never to forget that, Christing. Thanks for your good wishes and I’m enjoying the challenge of the garden re-do! Ah Harvey…he did leave a big big mess! He was a monster and the damage is so far reaching. We had some plants wash away and some other drown but that was the extent. Our home didn’t flood just the street, RofW and into a garden a bit. We reached out to clients and offered to get them replacement plants at our cost if they needed them. I still haven’t toured the really damaged areas. I am going to consult on a rain-garden and better drainage for someone. Yes, Laurin, Harvey was a messy guy, along with his sisters, Irma and Maria and the rest of the hurricane gang. Glad you didn’t really have any problems, ours was only rain, rain, rain with some downed limbs and trees. Hope the cleanup and re-planting is going well. Glad you avoided the worst! I don’t think there’s any need at all for you to minimize your loss. Of course there are many greater losses, but each of us has to cope with what’s in front of us. Even in my case, where my home and car are fine, I experienced a sense of real loss in terms of what happened to the nature centers and wildlife refuges. For one thing, they were inaccessible for weeks, and in some cases there still may be closed roads. I didn’t realize how much a part of my life they were until they weren’t! I found a few more rain lily seeds that I’ll send along, too. Do you want any basket-flower seeds? They’ve been plucked and cleaned by my own hand! Yes, you’re right about loss and that “it’s” missed–whatever that “it” is, when you no longer have it. I’m so sorry about the refuges; I hope they can recover and that you can continue your wonderful wanderings. I’ve always been hesitant about prickly pear and agave-type plants because they get so large. But I have some shade-loving mahonia (non-native) that is in this formerly shady, but now sunny garden, and I have a feeling that it’s gonna fry come next summer. My neighbor has some prickly pear, and I’ll think about adding that, but thank you so much for your offer. You’ve given me some basket flower seeds, as well as the rain lily seeds and I’ve spread some already! Thanks so much! Another friend shared some blue curls (mine have never re-seeded) and I bought some Drummond phlox seeds from the LBJWC– so I think I’m in good wildlfower business for this next year. Looks like we are in the same boat…shade to sun. I ought to be thrilled, but I was finally starting to get the knack. Dragged unwillingly? 🙂 Like you, I had it all down; alas, nature had something else in mind for my garden. I’m glad though that you and your community are safe, though I know cleanup is a drag. Thanks–I though the same as I looked at your photos–yours is a lovely home, nestled in a stunning landscape.